Work smarter not harder- this seems to the mantra that pulled Office 365 to the spotlight and as a result, saw widespread adoption across diverse organizations. Office 365, which was introduced in 2011, essentially unified all existing Microsoft services onto the cloud. By this, it has accomplished several goals- allowing mobile access, simplifying processes and primarily permitting absolutely effective global communication and collaboration. By allowing all employees, partners and customers to operate from the same platform- Office 365 has made it easy to streamline the process and create real business outcomes. But, the struggles that businesses face why adopting Office 365 is the difficulty involved in moving from the traditional infrastructure to a cloud server. What makes it even more complicated is if the said organization is large and has offices all around the world. 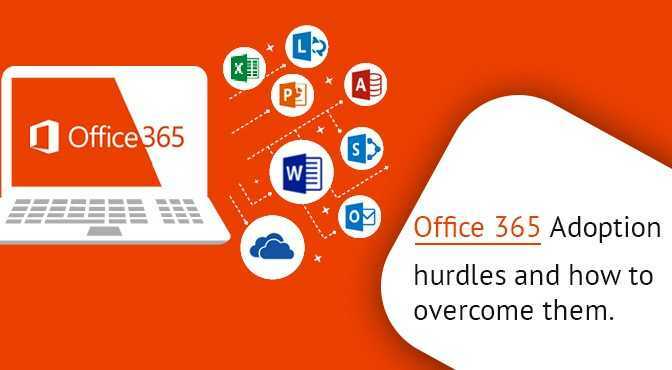 It is evident that Office 365 offers a lot in terms of increased work productivity. However, it does take some time for organizations to get adjusted to the changes. So, what are the roadblocks that organizations come across during Office 365 adoption process and how can they be addressed. After getting used to certain applications for years, most users in the company may not be willing to change and adapt to a new system. Therefore, in order to optimize your investment in Office 365 and to enable better collaboration and connection, it is vital that everyone in the company is onboard. Start with identifying crucial backers and then connect them with your core team to create a plan for successful adoption. Additionally, while you educate technologically-challenged users, you may notice that the tech-savvy users may try to utilize advanced tools that you aren’t ready to operate yet. Therefore, make sure your team and you are on the same page when it comes to when/how the tools should be utilized. One of the biggest concerns regarding Office 365 adoption is the security issue. Despite many promises given by cloud servers, there is a concern among businesses if their data will be compromised due to the subpoena issued by overseas governments. Industries such as finance and healthcare may need additional 3rd party security tools to secure customer’s confidential information and have more data stored on-premises. It is a given for organizations to be concerned about storing huge amounts of data on a public cloud server. However, it should be noted that Microsoft has taken many serious security measures in the last few years. It offers encryption and rights management, DLP anti-spam, proving to be the most reliable technology partner. 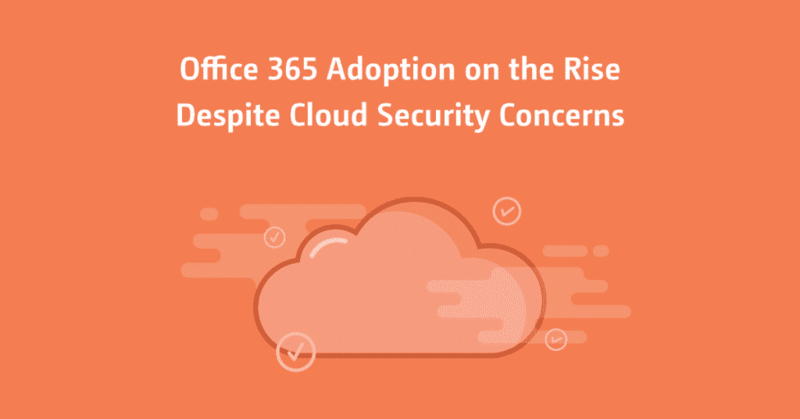 It is vital that companies deploy strong hybrid Office 365 environment via which the establishment can regulate the access of end-users and control what data can be stored on the cloud platform. If your company needs extra protection, you can opt for a cloud back-up solution as well. To get answers to your security-related queries you can visit the Microsoft Office 365 trust center. Moving to Office 365 requires the users to stop using their old email platforms or email exchange systems. Furthermore, they also need to transfer all their previous emails, contacts and calendar to the new Office 365 mailbox. This can be seen as a very large task to users who are used to their old system- therefore possibly causing prejudice against migration. You may even find users going back to their traditional system for communication. Other than these options, you can also use Internet Message Access Protocol (IMAP) to migrate user’s emails from Outlook, Gmail or Exchange etc. The speed and efficiency of migrations may vary across diverse organizations. Most of them want to hold on to particular crucial parts of their on-premises environment before they go ‘all-out’ on a cloud setting. While this tactic can be exceedingly effective in a way that it improves the end-user experience and simplifies post-implementation support – it requires a more tiered and organized way of implementation. Businesses choosing hybrid solutions also need to think about deciding the pace of transitioning and examining which parts need to be retained at the given stage of migration. While a slower approach may increase costs and possibly reduce the value, a fast approach may confuse the end-user. According to statistics, user confusion was noted to be a major issue during migration with 46% of organizations citing it as the reason, i.e. a challenge in Office 365 adoption. One solution to solve on-premise/ cloud co-existence problem is integrating active directory synchronization. Employers are feeling the positive outcomes by using Office 365, with more and more professionals claiming increased productivity, cuts in costs and better security after migration. One major element of migrating to Office 365 is to realize that the adoption is a continuous process. As your organizational needs evolve, new services are released in Office 365 accordingly. Therefore, continuous improvement and adoption must continue to be the key component for your business. The best approach is to assess if the benefits provided outweigh the effort of overcoming the abovementioned challenges and decide accordingly.